For about 15 minutes this President’s Day Weekend, I managed to fulfill one of my Kindergarten aspirations – I was one of the Presidents of the United States. 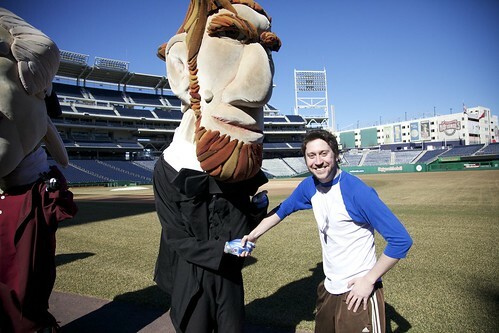 Background: it’s become a bit of a President’s Day tradition that the Nationals host their annual mascot auditions at Nationals Park. As Rachel’s awesome recap last year was quick to note, sticking to the holiday weekend that recognizes the same men these mascots represent is so important that the try outs are held shine or snow. I joined in with a few other members of the media – Lenny Bernstein of the Washington Post and Danny Rouhier from WJFK 106.7 The Fan – and we got a chance to go through the whole process. I will tell you: my respect for the people who don the Presidential Gear for about 35 games every season has shot through the roof after spending a lap inside the costume. 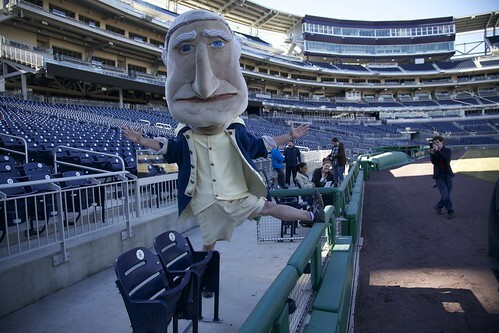 There are a lot of secrets and traditions with the Nationals’ mascots. As you would guess, the identity of those selected is kept close to the vest, and because of that, we were not allowed to get too much detail from the participants. We had to follow a lot of rules ourselves, which is why you won’t unfortunately see any photos of me half wearing the 45-pound visage of Abraham Lincoln. After all, just like the mascots can’t talk while in costume, we don’t want to break the fourth wall. Along with Danny and Lenny, I was able to get the walkthrough on the whole day as if I were one of the 52 applicants on site on Saturday morning. While there may only be four presidents in the race, there will end up being about 10-15 people selected to join the team during the season. Among that group, there were several veteran presidents, as well, since even those who have earned the role in the past must try out again every season. Applicants were asked to do a few things while demonstrating their ability to handle the weight and gravity of the costumes. 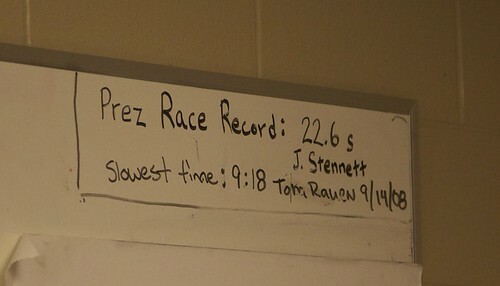 First, after getting suited up, there was the timed 40-yard dash. After that, a series of two races from first base around the warning track to deep right center field and back. The final test was a small dance-off and a victory pose. For veterans, that’s probably nothing, but when you add in the new experience of that much of a top-heavy costume and the ridiculous winds of Saturday morning, you have yourself a challenge. Our “media heat” was held as the third contest of the day, and the three of us picked up our costumes for Abe, TJ (that was Danny of WJFK) and George (Lenny) after we got a little bit of a preview of the wind factor. I’m a decently tall guy, as you can see from the photo above, but you feel short really quickly after putting on the frame and get-up of these costumes. If you ever been hiking for a long-term trip, you’ve probably worn a heavy camping backpack – as these outfits are built on a similar frame, it’s a very similar feeling. Instead of a tent and a few days worth of food, though, you’re dealing with the nine-foot likeness of one of the presidents. That’s just the weight of it all, the bigger challenge came from two other factors. The first being visibility. I was pretty confident walking out of the park’s concourse and onto the field because our first task was the timed 40-yard dash. That was a straight line to run down, so nothing to worry about in terms of anything crazy. With adrenaline pumping, I managed to out dash my competitors (by far the proudest I’ve ever been of an eight-second 40 time), but then the real concern hit me: how the hell was I going to trust my lack of peripheral vision to make turns around the right field warning track? I became over focused on my lack of turning and managing the gusting wind (that was the second challenge) of the right field corner, and Danny as Tom Jefferson passed me in the final turn and I couldn’t catch him in our racing heat. At that point, I was just focusing on standing upright and getting to the dance off, which I knew would be my strong suit. You haven’t lived until you’ve done the John Wall dance dressed as a nine-foot version of Abe Lincoln. My victory pose? The highlander, naturally. By that point, I felt completely victorious for getting all the way through the audition with minimal embarrassment or falling over. The Presidents Race is taken very seriously by the team, so much to the point that Teddy isn’t even an option for the mascot auditions (Scott Ableman, author of the outstanding Let Teddy Win blog had more than one theory as to why, but I think it’s just because the joke stays funnier if Teddy can’t even win by accident during auditions). Beyond that, there are records kept of the best and worst times in the history of the five-year Nationals gimmick, as you can see in the photo above. 22.6 seconds from left field to first base is a ridiculously impressive time when you consider how much that person had to carry. 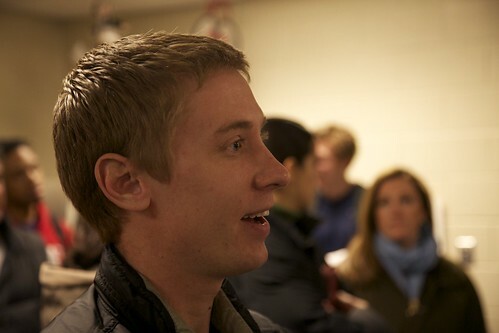 Talking with some of the contestants, I began to see a pretty interesting split in who was there and why. There were some “professional mascot” types (not making that phrase up), as I got a chance to speak with people who were actively mascots for other pro and college teams. Then there was one character who was taking his time out of costume to show off his show business skills. Whether this was just a cool story to tell or a continuation of a career in mascoting, it was a memorable day for everyone, I’m sure. All in all, this was one of my more entertaining days as a sports fan in DC. There’s a reason that the presidents and the race itself has become a key part of the fan experience at Nationals Park. As the team gets better over the next few years, this will definitely be one of those key parts that makes the DC baseball scene fascinating. For me, I just can’t wait until opening day on March 31, and when the fourth inning break comes around, I will stand and applaud the four people who have taken on the roles of the presidents.